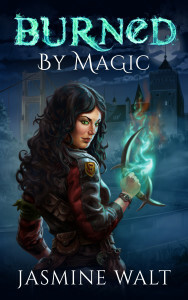 Burned by Magic: Book Launch Giveaway! Locked up in the Chief Mage’s castle and reduced to little more than a lab rat, Sunaya resists his attempts to analyze and control her at every turn. But she soon realizes that to regain her freedom and catch the killer, she must overcome her hatred of mages and win the most powerful mage of all to her side. *This contest is open to US, UK, and Canada residents only. A winner will be chosen on 12/24/15.